With Thanksgiving being tomorrow, I wanted to reflect a little bit on what I am thankful for this year. I know it's cliche and we should be thankful year round, but I love this little reminder of a day to thank God for what we have. It's so easy to focus on what we don't have and forget all that we do have. We all go through struggles in this life and have moments where life just isn't going our way, but even amidst the trials, there are still so many blessings. 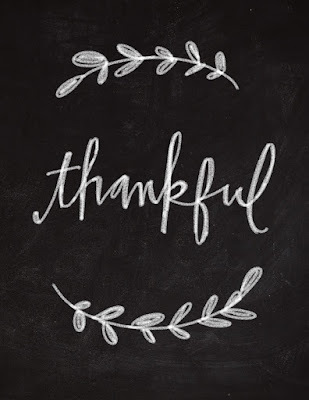 Here's one that comes to mind: I am really thankful for my health and the health of those I love. Good health is something I think so many of us take for granted. It's something I don't think I fully appreciate because I've never been seriously ill or had to fight for my life, but so many are spending the holidays in the hospital doing just that. The ability to walk, talk, see, hear- these are such gifts! I want to keep this short and sweet. This Thanksgiving, I encourage you to approach life with a grateful heart. I encourage you to thank God for all of the many blessings in your life. Let's not focus on what we are waiting or wishing for, but instead what we have been given. God is good, yall. Happy Thanksgiving from our family to yours! Happy Thanksgiving to you and Parker!